A photograph showing Cynthia Tilson Conklin Rogers accepting the National Distinguished Service Registry award for her contributions to the rehabilitation profession. Rogers worked as a job placement specialist at the Menninger Return to Work Center in Topeka. The job placement program offered assistance to people who were entering the work force for the first time as well as those who were returning after a work related illness or injury. She was the regional representative of the job placement division to the National Rehabilitation Association in 1988-89. 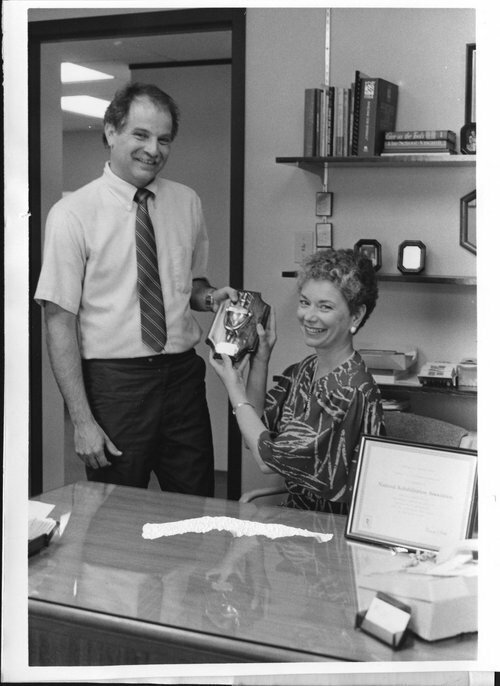 Rogers received the Outstanding Kansas Job Placement Award in 1987 from the Kansas Rehabilitation Association.